A Fairy Lily, Zephyranthes, is also called a 'rain lily' because of its tendency in the wild to bloom after a rainfall. Plant the bulbs about an inch and a half deep, and 3 inches apart in a part of the garden that receives full sun. They require a rich, sandy soil with a little bone meal added in. Zephyranthes are tender bulbs, so if you live in an area of hard freezes, you will have to dig the bulbs and re plant again in early spring. 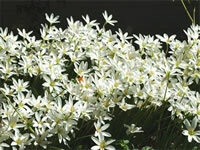 Fairy Lilies do very well growing in a flower pot, in a sunny window, as long as it's semi cool. If you have the right spot in your house, plant them all in the same 6 inch pot. That's what I'd do!